The Boulevard de Favauge is located to the north of Zandvoort and it stretches from the Strandweg to the Jacob van Heemskerckstraat. It was in 1875, that Adriaan Christian Jacques de Favauge was married to Maria Catharina Barnaart and in so doing he came the main landholder in Zandvoort and also incidentally the last person to hold this title. 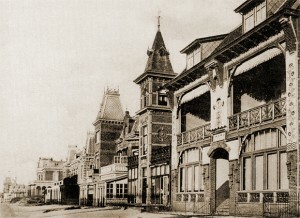 Today the Boulevard de Favauge sadly displays none of the elegance and grandeur or the verandas and balconies which are in evidence in the photo – right.